ito pinaka hihintay kong matchup. naalala ko when i was a kid bonel balingit vs ej fiehl..
Nakakatawa naman ang comparison mo to think na si abueva e lebron james ang level ha at si cyrus na kobe tapos si buenafe si caguioa hahaha! Hay minsan ok din na hindi ka ma hide e no, pampalipas oras din. they are like Ildefonso and Adducul nun college days nila if only adducul choose to play sa PBA baka ganyan din nangyari sa kanila dati.. It seems sa CESAFI Slaughter got the better of June Mar. But June Mar has become stronger and better so the situation is a bit different. But for the first time in the PBA June Mar will meet somebody who's taller. It will be interesting to see if he can overpower Slaughter just like everybody else in the league or will he try to finesse his way against him. In defense will see if he'll be able to stop somebody taller and who has some heft. Based from the articles ive read. Lamang si junemar one on one matchup, pero one man team lang si junemar. Greg had better help from team mates.. May mga naging former pba players pa nga. Then greg went to manila and played for ateneo kaya mas natrain sya ng maigi. Malaki ang ginaling ni Slaughter sa Ateneo compared to his CESAFI days. Although talo pa rin siya kay June Mar despite that improvement. No doubt about it. lamang si Fajardo pero may ibang skills naman si Slaughter na pwede niyang i utilize. Just look at Balingit's talent in the video. Balingit = Fajardo sabi ni pbadorm. Ang layo pbardorm. Halos walang hawig ang laro nila. 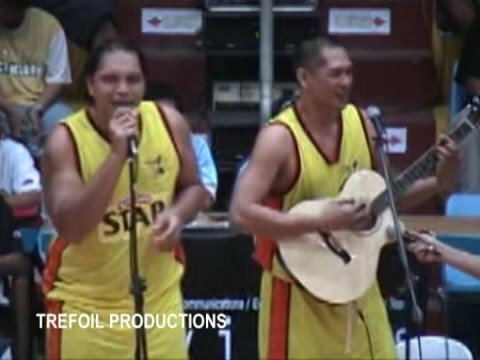 Kung pipilitin mo pareho silang infuenced in Ramon Fernandez. Si Balingit nun may "elegant" shot siya. Maganda ang shooting form ni June Mar. Pero ang layo ng laro nila pre sa katawang palang. Huwag mo ng piliting ang comparison kung di pwede. Pero kung sabagay si Yeng Guiao ba nagsabi dati na parang Balingit daw si June Mar ? June Mar Fajardo is now way ahead of Greg Slaughter skills wise. Remember, Fajardo honed his skills in the ABL after a stellar collegiate career with University of Cebu. There he was ranged against taller and burlier imports. He showed some improvements with Petron and even became a better player after his stint with Gilas Pilipinas in this year's FIBA Asia Championship. I think Junemar is still the 6'9+" (and above) to beat on this Season 39, especially on the 1st cup. Greg will still make some adjustments while JF is already well accustomed to his team. Many Alaska fans were already anticipating JF before his ABL stint with San Miguel, kasi nga coach nya ang former Alaska gunman Coach Ruel Gomez, kaya may idea na kami on his capabilities (but since binakuran na ng San Miguel, eh we're happy that someone like Abueva can be a possible draft instead). JF will definitely remain a monster on the next 7yrs pa.
Si Greg he'll reach that level maybe on his 2nd yr., syempre nandyan din si Japeth sa GSM kaya "subconsciously" the need and urge for him to be the most dominant BIGMAN player in the team would not be right there agad (unlike on Junemar's case). Even pwedeng magkaiba sila ng position na lalaruin ni Japeth, I still think na hindi pa mahihigitan ni Greg either si Japeth or Fajardo at this moment. Maybe after 3-conferences we can see a very competitive Fajardo-Slaughter rivalry.